Still here? The site moved. Well, things came up in my life [i.e. work] and I wasn't able to make the website unveiling today as I had hoped to. And I'm going to need the extra time to work out the contest and the site to my liking. But please do come back, cause free stuff is, well, it's free, buddy. I'm going to shoot for this coming Sunday, February 10th. See you all then. In the meantime, start re-watching Clone High and Mission Hill to answer these upcoming questions! I know it is odd of me to not post on Snowflake Day. It's not that I didn't want to. I was away on a trip and I don't [yet] have the ability to automate my updates to post on certain days. Check back on February 5th, the anniversary of this site on the net. An all new website will go live with RSS ability, new website design, and more coming soon, and to kick it off, I'll be having contests and give-aways, so do come on back. I have gotten my grubby little hands on ToonBoom Digital Pro and it is wonderful. For any other aspiring cartoonists out there, I would definitely suggest it. It's a bit pricey, but if you attend college, you can get quite the discount. I'm sorry I don't have anything to show just now, but I did have some things I wanted to mention. First of all, CLONE HIGH IS NOW AVAILABLE ON DVD IN THE US OF A. How about that? It's official release date was December 18, 2007. Both BestBuy.com and Amazon are backordered on it, but expect more. I'm going to check around some at actual stores, but boy are their prices for Clone High steep; around 35 dollars. Such a high price for a DVD that was released over two years ago. Wow, I can't believe its been so long (not to mention I have little to show for my effort online, but I will). I'm rewatching all the shows to get me back into their animation style, plus I'm rewatching all the ToonBoom tutorial videos to help streamline the process. I know I've said this before, but I hope to have something pretty to show you all next update. Well, my next update may be a movie review of "The Brothers Solomon" written and starring our lovable Abe, Will Forte. So far, I hate to say, but it's no Dumb and Dumber, but from what I've seen so far, it is still a very funny movie. Maybe I will be biased as Dumb and Dumber is my all-time favorite comedy movie, but, a review will come. I have not been able to get my hands on the program Toon Boom Digital Pro just yet. I have started a new job and am doing quite a bit in my life now, but am extremely eager to be getting on with making cartoons, partly due to my job having nothing to do with cartooning, so I see myself making great strides, as soon as I get going and get the program. I did however leave Comcast. And they were jerks about it too. Disrupting my tv and internet service for the last month and then not allowing me to access my email, yeah, jerks. Verizon FIOS, is awesome though, so yeah for that. Going along with that, my email address has changed. I know I keep saying this, but hopefully my next update is a better update. I have noticeably taken a pause from the online portion of my work. Incidentally, I have also taken a pause from the real work of making the cartoons. Not because of outside problems or work, but because I'm learning to use a new program. Toon Boom Digital Pro (previously known as Solo). I am really enjoying the program demo that I have and have decided to go forth with transferring over the whole workload to Toon Boom Digital Pro. Flash just isn't the better cartoon creator anymore and as soon as I can acquire the full version of TB Digital Pro, my production will zoom back on task. Before making this update about the program switch, I had hoped to have a somewhat secret update for Clone High fans, but the information that I have asked for hasn't come in quite yet. I do hope it won't be too much longer, for I, myself, would really like the information. So, I won't tease anymore just in case I never get the information, in which case, I will tell you all what I was trying to get. Take care everyone, and only watch cartoons that matter. Let your favorite station, like Teletoon or [adult swim] know what you like watching and what you don't like. It makes a difference. Not that mostly lame excuse for a Looney Tunes movie, but it is I, MHCH and my computer is all back to working order and I am now back working on getting these cartoons out the interweb tube and into your computer. I'll report back with a fun update next, I hope. It has been way too long without an update. For one thing, I finally got the forums back up and running, which I am incredibly happy about. I was scared that all the work and info I put into forum threads would be lost. Sad news, though, my computer has been down for about 3-4 weeks now as I have been trying many different things to rectify its random and instant death. I was actually in the middle of playing the new Sam and Max games and it just died (not due to those awesome games, by the way). I was able to get back into Windows within Safe Mode, and tried both System Restores and Drive Roll-backs, but to no avail. So I decided to delete my C: drive and try a fresh re-install. Well, a few weeks after problems with that, Dell has now come to say that my XP disk is flawed and they are sending me a new one. Hopefully this is the last of these problems, as I am not in the mood to buy a temporary computer since I plan on buying a super-computer sometime next year and can't do that now. More on my cartooning, however, I believe I am going to mostly pass on doing this work in Flash and try out ToonBoom Studio (Solo Edition). I think it may speed up production as I really am trying to keep to my promise of having Clone High Ep 14 done by the end of summer, (Here's hoping...) and from there, Mission Hill. I still see myself using Flash for this production, as they do work somewhat well together, and I'm used to doing at least my background art in Flash. I'm updating this on my work computer and don't plan on having to do this again. I want to be back on my machine soon. (Dell is being courteous and sending me a new CD, and this is like a 5 year old machine.) I also plan on adding an RSS feed to this site, since I understand that this isn't a site that gets updated often and I want to do all the people that come here a favor. And after my next animating surge and I feel a little burned out, I'll do what I can to use that downtime to add some flair to the forums. It's frankly a little embarrassing. So farewell for now, and I hope to be back online in short order. 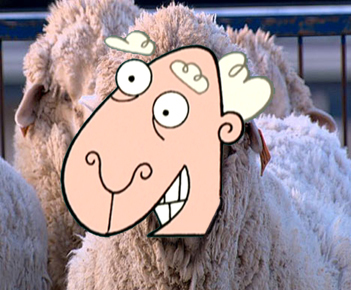 Scientists create a sheep that is 15% Human. "Scientists have created the world's first human-sheep chimera - which has the body of a sheep and half-human organs. The sheep have 15 per cent human cells and 85 per cent animal cells - and their evolution brings the prospect of animal organs being transplanted into humans one step closer. " We can only hope that cloning historical figures and placing through high school is the next plausible step! The last episodes of Gary and Mike have materialized on YouTube so go check out how that series ends. Does it have a more nail-biting ending than Clone High? You tell me. Let's just say I compromised. 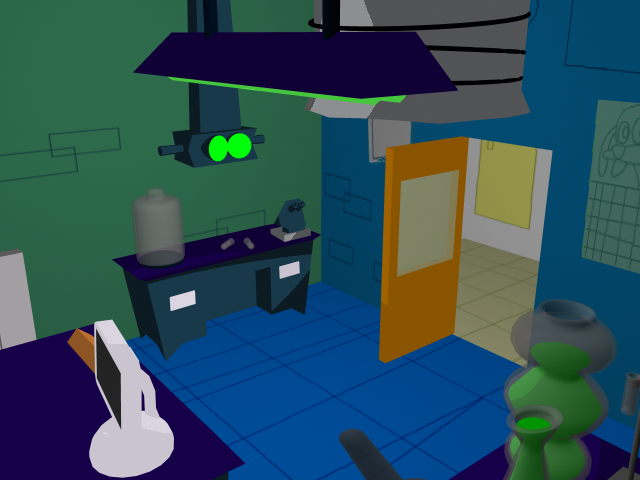 So I recently had a 3D project I had to do which involved creating a worldspace that a scene could take place in, and then run a camera around the scene, showing it off. After brainstorming a whole two seconds, I decided on what subject to re-create. Clone High. Then perhaps 10 seconds later I decided on Scudworth's Principal's Office. Check out the movie to take a tour of Scudworth's office. The main things I know are missing are the "Welcome Clones" doormat, and the "Principal's Office" lettering on the door. But do try to find the other fun things within the shot. And yes, you are viewing this world from the view of that hideous creature kept within that jar on his side desk near the microscope. 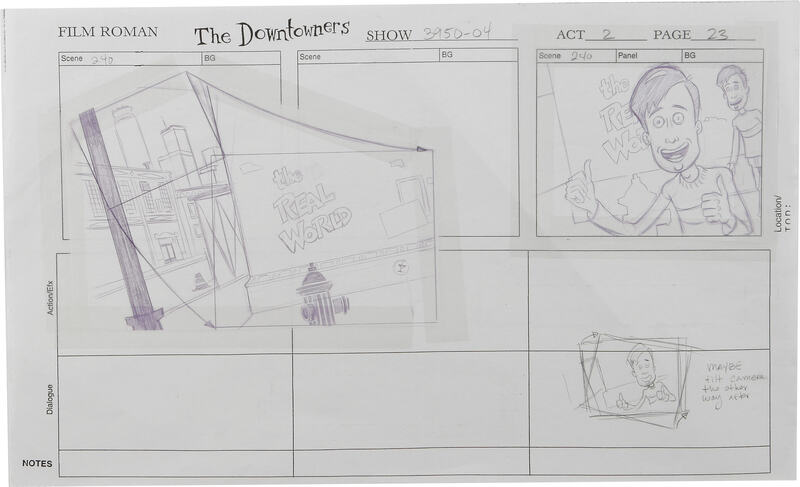 Recently I found a company that got their hands on Mission Hill production art. Mostly drawings that cels were made from, and are now in my hands. I have about 10 drawings now, and I can assume that they will put up more later, so check out Heritage Auctions every now and then. In random cartoon news, Nickelodeon is being sued for producing a certain show about a certain over-rated sponge, for its semi-resemblence to a sponge also named Bob who predates SpongeBob by a whopping year!1! Hmm, I'm not totally convinced that it is a blatant rip-off, but it is worth the read. I don't care much for SpongeBob, and my feelings may be mirrored over at Nick, as they just ordered only 13 episodes of the show, where Fairly OddParents got around 30! Fantastic news, The Venture Brothers is back for another season, and maybe even for another, as the network has all-but came out and made the fourth season official. We may never get the real version of Mad City's Remember the Memories, but this will certainly do. And I am fully aware that the forums have gone down. I had a problem updating the software and am trying to sort it out. And I will freak out if I lost all the work and info I put onto those forums.